Double-bill: Jens Östberg "Pre-study for Hamlet"
How can we coexist? To say “I” means turning the other into a foreign entity. Can intimacy embrace otherness to form a kind of common being? If our being extends beyond the limits of our skin can it reveal trace evidence of multiple ways of existing, symbiosis through belonging? How intimate can we be? Where does the surplus intimacy go? How much of our physical individuality is left at the end? How much debris of ego can I eliminate, and how much do I need? Angela Schubot and Jared Gradinger met ten years ago. In “What they are instead of” the two of them search for unconditional togetherness, in studio 1. They first worked together under the direction of Constanza Macras in “Mir 3: Endurance”, as well as in “Scratch/Neuköln” (2003) and “Brickland” (2007). Already in these productions they discovered a strong connection and common interest in purely physical yet very dynamic movement languages. They became fast friends and started to combine these physical practices with philosophical and even esoteric discourse. Angela Schubot is an artist, dancer and choreographer and studied contemporary dance in Berlin and is co-founder of Two Fish with Martin Clausen. Angela Schubot has worked with a.o.Rosalind Crisp, Theatercombinat Wien, Dorky Park/Constanza Macras, Benoit Lachambre, Pictoplasma and Andreas Müller among others. In 2004 she got the dance-web scholarship from Impulstanz/Vienna. Besides her most continuous collaboration partners Martin Clausen and Jared Gradinger she is deeply influenced by the artists Rosalind Crisp and Beniot Lachambre. In March 2011 the new and last work under the label “Two Fish”, a duet with Martin Clausen “Halt mir meinen platz frei, bis ich anders wieder da bin” premiered in HAU 2. 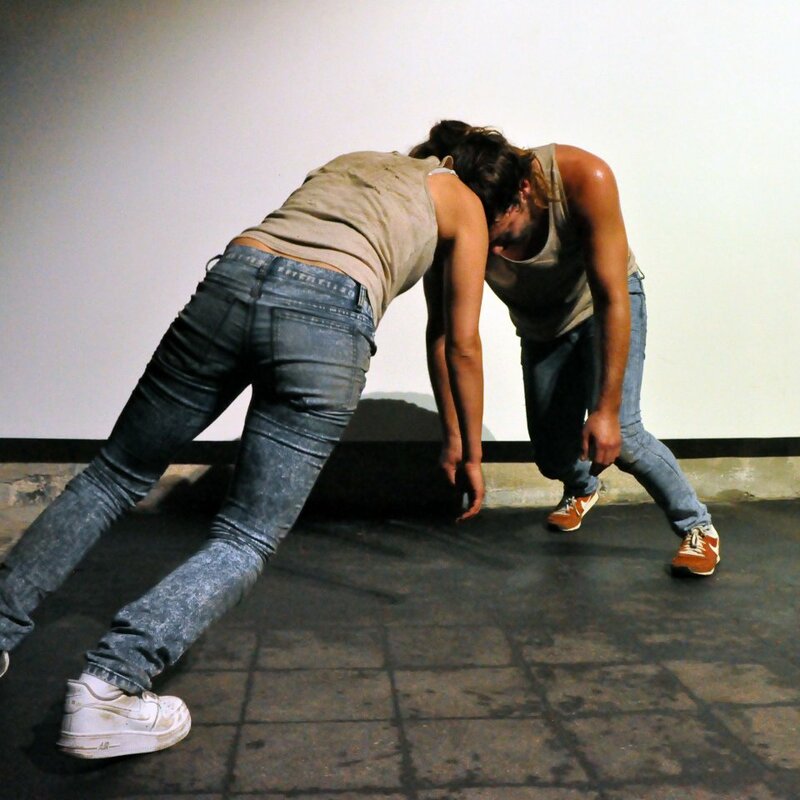 In 2011 she replaced Johanna Chemnitz in the piece “Soft Target” that was shown at “Tanzoffensive 2011” in Leipzig. Jared Gradinger is performer, creator and curator based in Berlin since 2002. Awarded performer of the year 2011 by Tanz International Magazine. His most recent work “IS MAYBE” is a collaboration with Angela Schubot and street artist Mark Jenkins presented in HAU1 Berlin. He recently choreographed “The Missing Link Show”, a two and a half hour concert event about the enigmatic yeti, in the Volksbühne Berlin: It was a part of Pictoplasma’s biannual international contemporary character design festival. In 2009, he also collaborated with Jeremy Wade for the solo “There is no end to more” commissioned by the Japan Society NYC. In 2008, he created the piece “Private Dancer” in the City Theater of Reykjavik in collaboration with Panic Productions. He is a founding member of Constanza Macras/Dorky Park. In 2008, he began a collaboration with Les Grandes Traversees in Bordeaux, France where he curated a 48 hour festival of contemporary art for the New Year called “How Do You Are”. In July of 2009, he launched the second part of the festival entitled “How Do You Are Beach” in Royan France and its neighboring towns, where he began his curatorial project called ‘Housing Projects’. Housing Projects is a parker of short format site specific works presented for an intimate audience in working/business spaces. The third part “How Do You Are: There Goes The Neighborhood”, was a larger scale “Housing Projects” presented in December 2009. Jared has worked with artists such as William Forsythe, Meg Stuart, Jeremy Wade, Rachel De Joode, Johannes Malfatti, Michel Laub, Masagon, Paul Notzold, Mark Jenkins, Aleesa Cohene, John Zorn, Hanayo, Discoteka Flaming Star and Mark Levine. Choreography & performed by: Jared Gradinger, Angela Schubot. Lighting design: Andreas Harder. Co-production: Les Grandes Traversees, Haus Der Kultren Der Welt, Schwelle7. In collaboration with Pictoplasma. Double-bill with Jens Östberg "Pre-study for Hamlet"